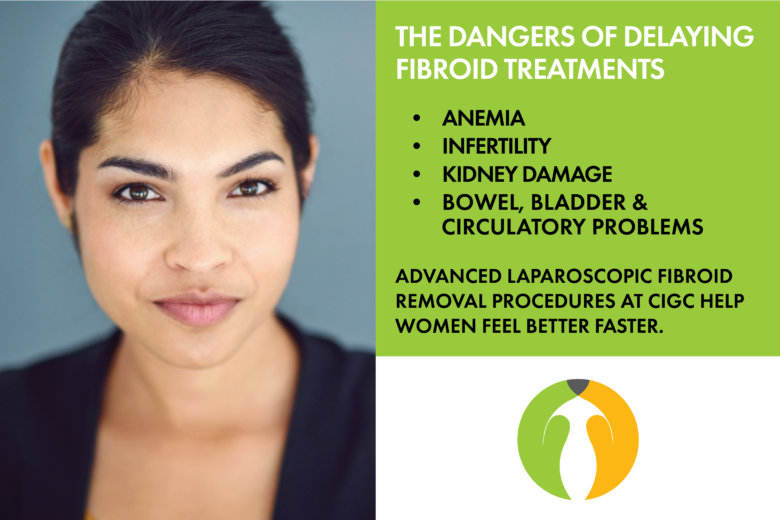 Ignoring the symptoms of fibroids can lead to long-term complications, including anemia, infertility and problems with the bowel, bladder or circulatory systems. There are many non-surgical treatments for fibroids available, but the limitations of these treatments in preserving fertility is not well understood. Uterine Fibroid or Artery Embolization (UFE or UAE), or fibroid ablation procedures are not recommended for women who want to get pregnant. Women should thoroughly research these methods, when choosing fibroid treatment. If fibroids are left behind, either due to them being missed, or due to a surgical procedure having to be terminated early due to excessive blood loss, they can continue to grow, and symptoms may persist. Thoroughly removing fibroids from the uterus should only be performed by a highly skilled minimally invasive GYN surgeon. Fibroids that are deep in the muscle or are very small can be hard to find unless they are felt and removed by hand. Unless all of the fibroids are removed, they can continue to grow, and cause problems with heavy bleeding, pelvic pain and infertility. Standard laparoscopic or robotic techniques do not allow a surgeon to feel the fibroids, and often, those that are left behind become problematic. Fibroid removal surgery can be performed as a myomectomy, removing the fibroids from the uterus, or as a hysterectomy, removing the uterus itself. A myomectomy is performed for women who are able to maintain fertility. A hysterectomy for fibroid removal is performed for women who no longer wish to get pregnant, and who suffer from recurring fibroids. It is important to find a surgeon who will take future plans for fertility into consideration. LAPAROSCOPIC FIBROID REMOVAL TECHNIQUES: LAAM FOR PRESERVING FERTILITY & DUALPORTGYN. A delicate procedure like a myomectomy requires the ability to feel in order to create the best possible result. A successful myomectomy requires the surgeon to remove fibroids often deep in the muscle of the uterus that cannot be easily seen. It also requires the surgeon to remove all the fibroids, including smaller ones, which can only be located by feeling them. LAAM is a minimally invasive fibroid removal technique that allows the surgeon to feel all of the fibroids at any location in or around the uterus and allows for their safe and effective removal no matter the size.